This 17 YEAR OLD SENIOR was OWNER SURRENDERED TODAY! Abandoned, adopted, and betrayed - how much can one little girls heart take before she gives up all hope? Dumped on the cold city streets, sat in a kennel desperate for a family. Why you ask? Because her adopter didn't have "time" for her. Even though she waited for him at the door to come home. She is beautiful, she is loving, she deserves a happily ever after - please don't let her die! NOT RESERVED CHUCHI WILL BE KILLED SHORTLY. Please share for an adopter or foster/rescue! (A0600629) I am a spayed female tricolor Terrier mix. The shelter staff think I am about 17 years old. 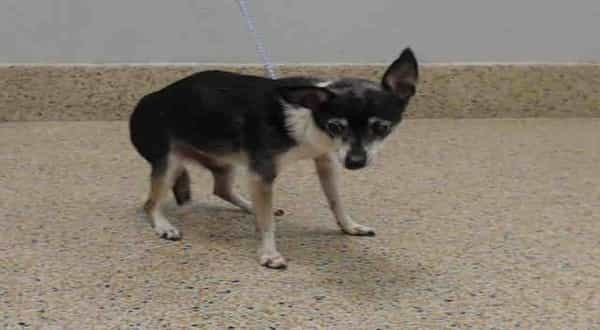 I was turned in by my owner and I may be available for adoption on 12/22/2017. 7 Responses to "This 17 YEAR OLD SENIOR was OWNER SURRENDERED TODAY!" If someone can get her to me!! I love seniors! I shared this to the Senior/Old Dog & Cat Rescue Network Facebook page. Someone said she was euthanized last week unfortunately.